Trombonist Craig Harris with his Septet - performing Brown Butterfly, a multi-media work based on the movement of Muhammad Ali. 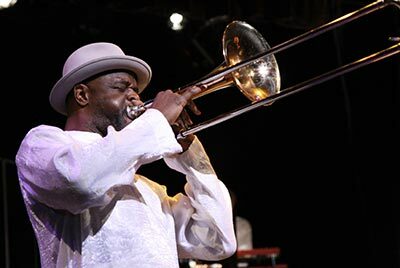 When Craig Harris exploded onto the jazz scene in 1976, he brought the entire history of the jazz trombone with him. He’s performed with a veritable Who's Who of progressive jazz’ most important figures - his own projects displayed both a unique sense of concept and a total command of the sweeping expanse of African-American musical expression.